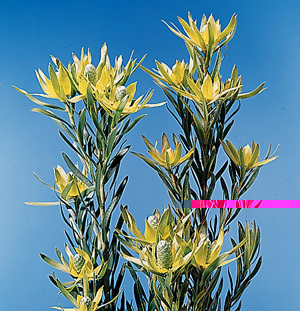 Home|Floral Library|Leucodendron – Leucadendron spp. or Leucodendron spp. Leucodendron – Leucadendron spp. or Leucodendron spp. Decorative Life: From 2-3 to six weeks depending on species, cultivar and/or whether one is measuring flower or foliage life. Regardless, this species will generally outlive most other flowers or greens in an arrangement. Harvest when the leaves and bracts are coloring but before flowers open. Do not harvest wet as Botrytis can easily result. Member of the Proteaceae (protea family). Common relatives include Banksia, Grevillea, macadamia and protea. Flower head is composed of stiff, colorful bracts surrounding a cone-like flower (female) or inconspicuous flower (male). Stems are covered with closely-packed leaves, 2-3 feet long. Plant is a woody, evergreen shrub, classed as a dicotyledon. The most common species (L. argenteum or Silver Tree) can grow to 30-35 feet. Fruits in the form of nuts can be retained for years, only released at maturity. If held dry in a vapor barrier and pulsed with sugar prior to storage at 34-36F, can be stored for up to 6 weeks. According to Faragher et al. (2000), two cultivars that store well are ‘Safari Sunset’ and ‘Silven Red’. Scientific name is from the Greek words “leukos” (white) and “dendron” (tree), referring to the silvery colored foliage. Varieties available include L. discolor ‘Flame Tip’ (yellow bracts), L. hybrid ‘Safari Sunset’ (burgundy bracts/foliage), L. linifolium ‘Tortum’ (ball shaped cones), L. salignum ‘Yellow’ (yellow, spreading bracts). More noted for foliage color. One common name indicating its interesting foliage use is silver-tree. Leaves can turn black due to low light and especially due to lack of carbohydrate. Therefore, make sure a fresh flower food containing sugar is used.